How do you stand out in the crowded field of social? What separates the good from the great? At STN Digital, we live & breathe social every single day, and to us, it’s pretty clear when a brand has a well thought out strategy with consistent content and community management. Below are some of the top brands that you should be paying attention to. With adidas being one of the top sports brands in the world, you would think they wouldn't need such an impressive social media presence to spread brand awareness. Think again. Not only does adidas’s main mothership account (@adidas) have over 3.45 million followers on Twitter, they also have a whopping 21.3 million followers on Instagram. Stemming from their mothership account, adidas has various secondary accounts, from adidas Originals, adidas Football, adidas Women, adidas Hoops, and so forth. All of these secondary accounts, retweet and repost one another to create cross-promotion. They utilize hashtag campaigns, celebrity endorsements, and have a consistent look and feel. Their content is complete with eye-catching graphics, innovative effects, and top-notch creativity. After you combine it all, this is exactly what makes adidas one of the top brands in the social media game. 2018 has been a year of health kicks. With many fast food chains having a bad rep of being ‘not-so-healthy,’ you would think many of them would see fewer and fewer fans. However, Wendy’s social media “fans” have been experiencing quite the opposite effect - they just keep coming! Wendy’s is leading the food industry in "gourmet social media" with no plans of stopping. They're engaging in a funny, light-hearted, and interactive way that you can't get enough of. Wendy's has set the bar on community management and how to properly engage with your fans (just ask Carter Wilkerson). Float on by for the delicious taste of our crispy Chicken Tenders. This one shouldn't be surprising as Taco Bell is known as one of the most innovative brands on social. On the marketing front, Taco Bell has been known for their ultimate ‘Fourth Meal’ or the ‘go-to drunk food’ after a night out. However, on the social front, they continue to be one of the leaders in the industry. 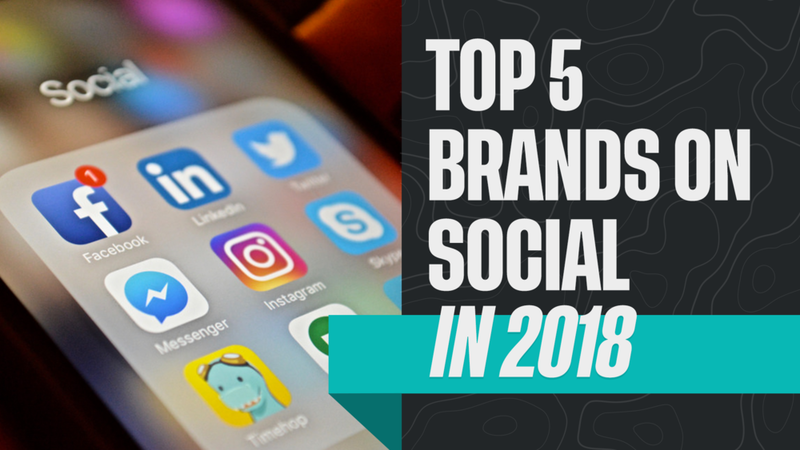 Targeting demographics, engaging with their audiences, using influencer marketing, highlighting tentpole events, and short mini-series strictly for their social platforms is what makes them one of the best on social. As many have said before, “It’s Will Smith’s world, and we’re all just living in it.” Will Smith, previously known as the Fresh Prince of Bel-Air, or nowadays, the father of Willow and Jaden Smith. No matter what, he is changing the game of social media for celebrities. Shockingly, Mr. Smith had never touched social media until his appearance on the Ellen DeGeneres Show on December 14, 2017. With a little over eight months since Will Smith joined Instagram, he has over 23 million followers and has set the tone for celebrities on Instagram. His pop culture trends and motivational talks have skyrocketed his social media following to put him in the same conversation as Kevin Hart and The Rock. They may not be one of the best sports teams at the moment, but they're one of the best on social media. From using consistent hashtags, engaging with fans, broadcasting player highlights and milestones, following current trends, and more, the Atlanta Hawks are setting the tone for sports teams on social. The Hawks do an incredible job of controlling the narrative no matter what is happening on the court.